I’ve been looking for some new software lately to help with processing credit cards online for our upcoming workshop series. One of the vendors I was investigating is WaveApps.com. But WaveApps has done something remarkable… something I’ve never seen before with this kind of document. It was a two-column page… in the left column was the legal copy. And in the right column, they summarized several of the paragraphs in plain English so they could be understood by us mere mortals. OMG! Right: We’d love for you to use Wave, but you’re just using it. We still own it. Left: Without prejudice to the foregoing, should there be a failure of or error, omission, defect, deficiency, delay causing downtime, or inability of a subscriber to access the Services for any length of time, including as a result of the permanent termination of service, the subscriber acknowledges and agrees that, except as otherwise set out herein, its only remedy for any error, omission, defect, deficiency, delay or other failure of the Wave Apps or the Services whatsoever is to discontinue using the Wave Apps and the Services. Right: If the service we provide is less than awesome, your recourse is to stop using Wave. I love this! First of all, 99% of us are not attorneys or contract experts and don’t really have a clue what these kind of documents mean. Secondly, it is clearly a part of their brand… to communicate to their clients and prospects in “plain speak” which helps them be perceived as a down-to-earth, comfortable, trustworthy company. The rest of their website is written the same way. Really well done. What about your firm? 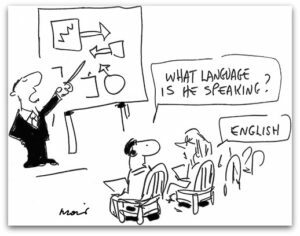 Do you speak in plain English to your clients and prospects? Even when it comes to complex topics like Max-Diff, Neuroscience or Prediction Markets? Think about where this might happen… in your emails, on your website, in capabilities presentations and proposals, in sales collateral, during webinars and so on. “But Steve, our clients are really smart people.” Good for you… but it doesn’t matter. I’m not advocating that you patronize your clients and prospects, just that you speak in plain English so that, regardless of how complex the topic, the listener has a much easier time absorbing the information. Even if they’re a bunch of PhDs. So, take some time to step back and look through your communications. Is it all clear, concise and (most importantly) easy to understand? Here’s the rule of thumb: If your 12-year-old daughter doesn’t get it… start over!